A hunter was this afternoon fined €2,500 after admitting to having shot dead a protected Cuckoo in Manikata this morning. Stefan Micallef, 43, of Naxxar, who was taken to court this afternoon, also had his licence suspended for three-and-a-half years. His shotgun and ammunition were confiscated. Mr Micallef had told the police he shot the bird - a cuckoo - by mistake, thinking it was a Turtle Dove. The applicable fine for shooting this type of bird was between €500 and €2,500. The police earlier confirmed that they had seized a cuckoo that was illegally shot in the Manikata area and a man was arrested. In a statement in the afternoon, Birdlife said its volunteers filmed the cuckoo falling from the sky after a shot was heard. A second shot was then heard from the area where the bird fell, and a hunter was observed searching the area and hiding the bird. The police were called to the site and seized the dead bird from where it had been hidden under a bush. Birdlife said it handed over all video evidence which should help to identify the hunter to the police. 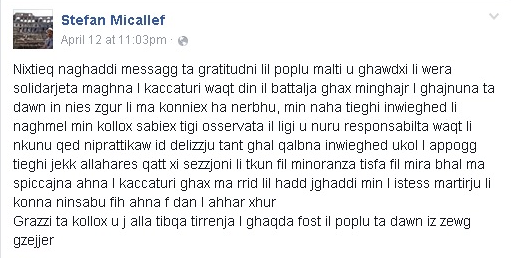 Facebook comment by Stefan Micallef on Sunday. Mr Micallef had posted a message on Facebook following the referendum result last Sunday, thanking everyone who voted yes. He committed himself to doing everything he could “to make sure the law is observed”. In a statement, the government said this was a sign that enforcement was working "effectively and immediately". It said that the police were acting on a report from Birdlife. "Whoever is caught breaking the law will find no protection and will have to face fines which were among the stiffest in Europe for their criminal acts," it said. The government also said that the government's warning was clear "if there are flagrant illegalities, the season will be closed". The statement came after several people tweeted about the incident using the hashtag #josephzommkelmtek . The hunters organisation St Hubert Hunters also issued a statement to "unreservedly" condemn the incident. It called for the appropriate penalties to be applied. "We emphatically state that given the mandate of the majority in a referendum that ultimately permits spring hunting we will not tolerate any abuse. "We appeal to all hunters and members of the public to report any illegal hunting activity to the police on telephone number 119," the association said. The FKNK hunters' federation said it had dismissed the hunter following the court's decision. The federation said that following the success of its referendum campaign it would not allow anyone to spoil what had been achieved. It also urged Birdlife and the public to inform it of any incidents and to report to the police on phone number 119. Prime Minister Joseph Muscat stressed on Sunday that illegal hunting will not be tolerated, after the ‘yes’ camp won the referendum. Hunting is permitted from two hours before sunrise until 2pm during weekdays and until noon during weekends. Hunters can reach a maximum quota of four birds during the season.